After publishing my blog last week I had a lovely long conversation with my big sister. Claire is an ER doctor, and a mummy to a very gorgeous two year old. Yes. My sister is very very busy, and had a particularly long difficult day when I spoke to her. Claire and I both love to cook, and our long detailed conversations about what we’re cooking, what spices we’re using, etc take up a large part of our chat time and amuse my brother in law to no end. Last week however the conversation felt a little different. Once respective children were plonked in front of the tv/you-tube, Claire told me how much she enjoyed the blog (thank you) I asked Claire what she was making for dinner “Oh” she sighed, “I’m just making eggs”, and there, in just that tiny sigh I sensed a slight fatigued exasperation, just a hint, and the exasperation was, if I’m not wrong was directed at me. Well, I had just suggested on this blog “Chicken is fast food – it’s so easy! Go make it”, and explained how making fresh bread from scratch could save time. The recipes I gave last week are delicious, and easy, but not so helpful if you need to put dinner on the table in ten minutes. Well. So, I replied to Claire “That’s great! We love eggs!” and we do, and we eat a LOT of eggs. So, this week I’ll give you three of our favorite meals, that are so easy and so quick, and two of them can be on your table in under ten minutes. And hopefully will make me more popular with my big sister. Now I’m not getting overly excited about writing about this kind of food. It’s MUCH more fun giving recipes for easy rum truffles or a delicious beef stew which I hope to give in the next few weeks, but these are probably some of the most useful meal ideas to have under your belt. All delicious, all satisfying, all thoroughly unsexy.... Think of them as your sensible walking shoes. In fact,talking of shoes, I once read that women in the UK have more high heels in their wardrobe then any other kind of shoe, yet wear them the least. That’s how we work. So, here we go, the most important food we need to master is the quick, healthy suppers, while the cookbooks we buy have the intricate complicated dinner party food. This isn’t a recipe of course. It’s a very enthusiastic reminder. In our weird culture where we either ban or worship carbohydrates we need to make sure we don’t go to extremes. The baked potato can be the base for a great meal. So unfashionable, but so delicious and satisfying. 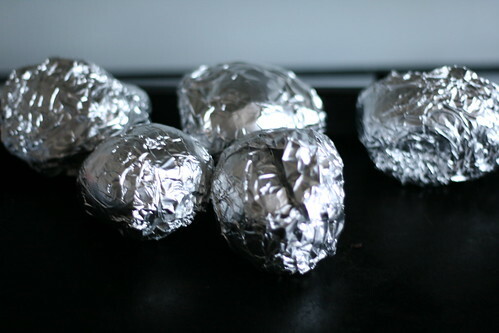 Scrub, and wrap your potatoes in foil and bake for an hour or so at 350° Fahrenheit, or if you want to eat sooner, set the oven to the hottest it will go and they will probably be ready in 40 minutes. Serve with whatever your heart desires. For me, it’s cheddar cheese and plenty of salt and pepper, but of course your options are endless, open a can of tuna and some sweetcorn, sour cream, parmesan, and never underestimate what some hot sauce can do for your food life. Honestly whatever you have lying around. Make sure you serve some salad with it – those prewashed leaves are really great. Dinner done. Most kids love this. The most important thing now is that you make twice as many potatoes that you need for your supper. Keep them in the fridge in the foil!!!! I make this a lot. This is the easy kind of egg dish to make for people that don’t like eggs. To me it tastes a little like a latke, mmm. Now, take your already baked potato, and dice, leave the skin in delicious and nutritious – count on one small for a woman, one medium for a man. Heat a medium/large frying pan – depending on how many people you are cooking for. Spay some oil on your pan and sauté your diced potatoes at a high heat until golden brown and crisp and crunchy. Sprinkle some salt and pepper on. While your sautéing your potatoes, whisk some eggs in a jug with a little salt and pepper. Two for women, three for men (I’m not sexist, men just need 500 more calories then women that’s all). Spray a little more oil in your pan, and pour the eggs over the potatoes. Once set on the underside, carefully flip over. Cut into wedges and serve with salad or some other vegetable. EASY!! Please try this – it’s really good. Children who don’t like vegetables, or soup, really love this. It’s great for a mid week lunch/dinner, but good enough to serve before a fancy meal. In your saucepan or pot heat about 4-7 cups of water on high until boiling. Add as much or little chicken soup powder as you like and taste – I use all natural, vegetarian msg free, add some salt and pepper. Depending on how many people your feeding and how much leftovers you want. Add a bag or two of frozen broccoli, allow to cook for about four minutes, and puree with an immersion blender. Done. Check for seasoning. Now I always make sure I have some cooked rice in a bag in the freezer – It’s a great habit to get into when you have some leftover rice. If you have rice, put some at the bottom of each bowl, and pour the soup over. If making this for children it’s a great bonus that the frozen rice cools down the soup. If your serving adults make sure you put the rice into your bowls after you’ve put your pot of water on to boil. Now there are days when this is enough of a dinner for all of us, but it’s probably a good idea to add some kind of protein to round out this meal, a boiled egg, some cheese, or, at this time of year a delicious mug of hot chocolate for dessert! Dang...I forgot all about baked potatoes. Dinner for Monday. Thanks.